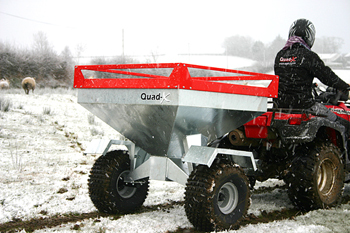 Ideal for those looking better control over stock feeding and more ground clearance! 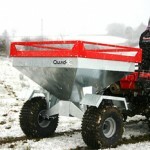 The Quad-X AutoDrop Stock Feeder has been innovatively designed to simplify the task of outdoor winter feeding. With the industry leading ground clearance it is ideal for travelling through lanes, tracks and fields to feed your stock. Fitted with the most sophisticated controls on the market it gives the user better accuracy with feed ratios, the electronic drop counter descends to ensure no wastage once zero has been reached. Also fitted with a fault system to alert users if problems do occur. 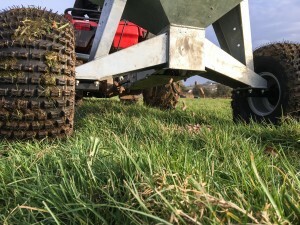 Fitted with the Industry Leading Ground Clearance of 342 mm as standard, making it ideal for travelling through lanes, tracks and fields to feed your stock. Designed to have the industry lowest fill height of 1095 mm and a low centre of gravity for extra stability ensuring it is ideal for travelling up steep banks, fields and hills. 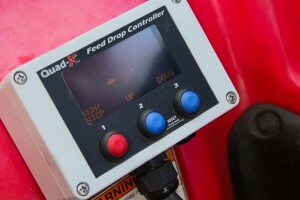 Fitted with the most sophisticated controls on the market it gives the user better accuracy with feed ratios, the electronic drop counter descends to ensure no wastage once zero has been reached. With feed distributed in spaced out piles, stock stand head-to- head so there is less trampling and fouling in the feed, meaning less valuable feed is wasted, saving money. 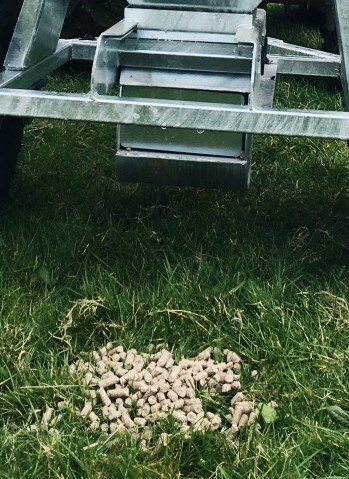 The hopper has been innovatively designed to transfer the weight of the load to the ATV; reducing weight on the back; spreading the load and making it suitable for steep and hilly ground. Fitted with 22-11×8 flotation tyres to reduce ground pressure and making the machine suitable for use on most ground conditions even when full. 370L capacity as standard or optional 550Lcapacity hopper available. Galvanised for durability and long life. The Quad-X AutoDrop Stock Feeder has been designed with an innovative nudge bar to keep hungry livestock getting stuck underneath the hopper.